Disaster Restoration Services, of 338 Airline Ave., Portland, wrapped up their annual coat drive on Wednesday, December 12th. 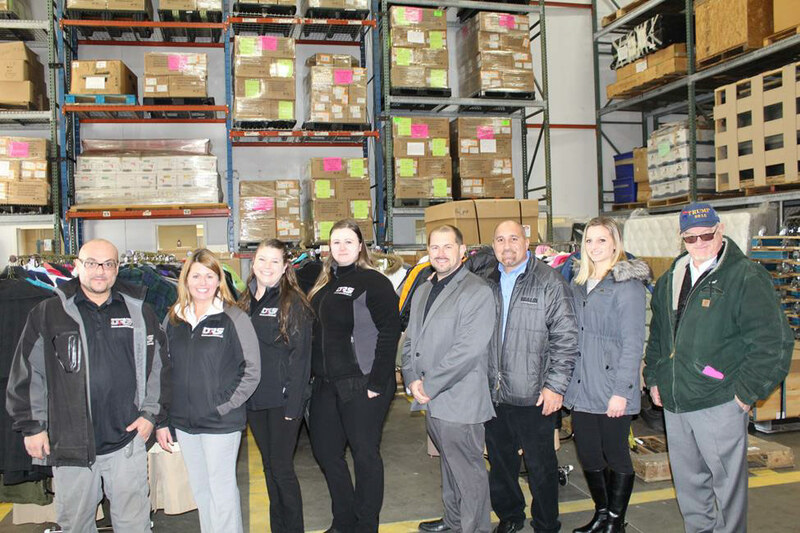 The final delivery was made to Button Up Connecticut headquarters out of Siracusa Moving & Storage in New Britain, where owner Dan Siracusa was presented with 710 winter coats for the mission. Over a three month period of time, DRS worked with over 30 collection points across the state of Connecticut, those places consisting of insurance agencies, property management companies, schools, local businesses and municipal buildings. Button Up Connecticut’s mission is to collect clean, new and gently used coats and distribute them to residents in need all across Connecticut. The coats are received from various companies, schools, churches and other organizations throughout the state who run their own coat drives and donate the coats they receive to Button Up Connecticut for distribution. The coats they collect are provided to local non-profit agencies (schools, churches, children’s homes, shelters, food pantries, and other social service agencies) by appointment only for distribution to their clients. DRS teams up with Sal’s Clothing Restoration in North Haven annually where Sal’s receives all of the coats after collection is complete & they clean the coats at no cost as well as deliver them to Button Up Connecticut. 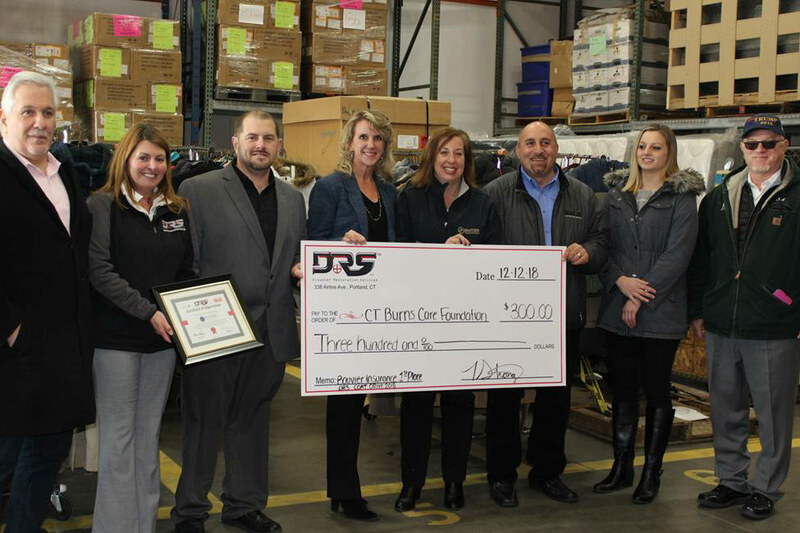 “DRS is definitely the top donor of coats every year” said Kara Lucht who helps run Button Up Connecticut. “Last year, 492 coats were collected so this year we set our goal to 600 to top that! We came in well over our goal at 710” said Tammy Strong, DRS Vice President who began this tradition 4 years ago. Of course, there is nothing like a great friendly competition, so this year DRS went a different route. In lieu of “prizes”, the top three collecting locations received donations from DRS to three charities in their company names. First place collector, Bouvier Insurance of West Hartford, collected 179 coats, got a donation of $300 to CT Burns Care Foundation in their name. Second place collector, South Oxford Management, collected 177 coats and received a donation of $200 to the CT Food Bank in their name. Third place collector, Olderman & Hallihan Insurance of Ansonia, collected 69 coats and received a donation of $100 to the Ronald McDonald House Charity in their name. Agencies can set up appointments to get coats for their clients by emailing Kara Lucht at klucht@siracusamoving.com or call the Button Up Connecticut Hotline at 860-259-0239 or for more information visit www.buttonupconnecticut.com. First place winner, Bouvier Insurance hands a check over to CT Burns Care Foundation Executive Director Kathlene Gerrity. Pictured from left: Dan Siracusa, Owner of Siracusa Moving & Storage & Founder of Button Up Connecticut; Tammy Strong, DRS Vice President; Danny Strong, DRS President; Kathlene Gerrity; Suzanne Gendron, Bouvier Insurance Media Marketing Director; John Mastrioanni, Manager of Sal’s Clothing Restoration; Jackie Barresi, Sal’s Clothing Restoration North Haven Plant Manager; Sal Jr., Sal’s Clothing Restoration President.